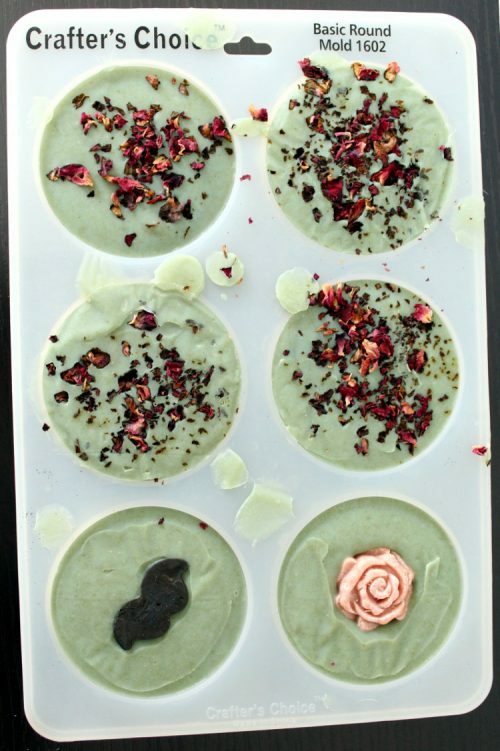 Learn how to make this homemade green apple soap recipe! 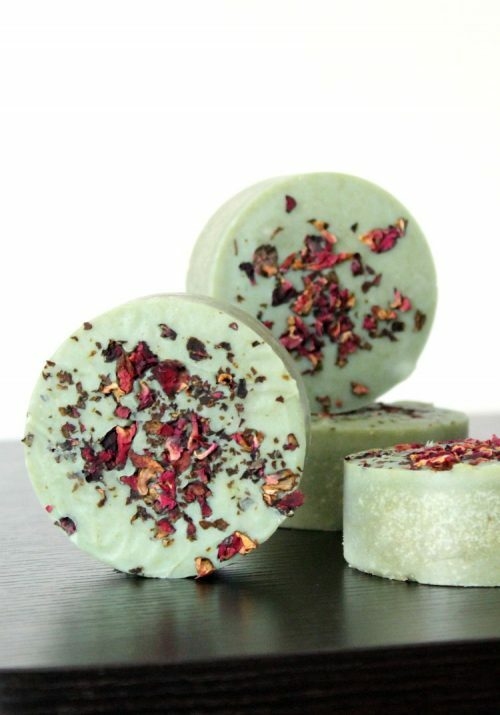 Crafted using the cold process soapmaking method, this green apple soap recipe is made using real apple powder. Apple powder is naturally rich in alpha-hydroxy acids that can help to improve skin texture. In addition to rejuvenating skin’s look and texture, it also helps to promote skin elasticity and has moisturizing properties. 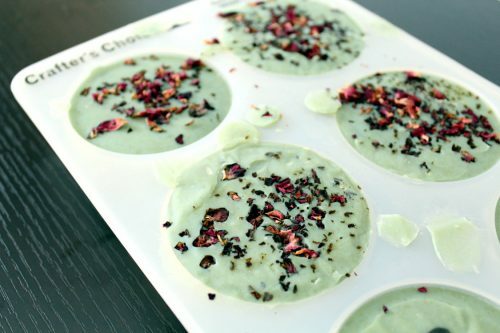 These properties make this green apple soap recipe particularly suitable for dry or mature skin. 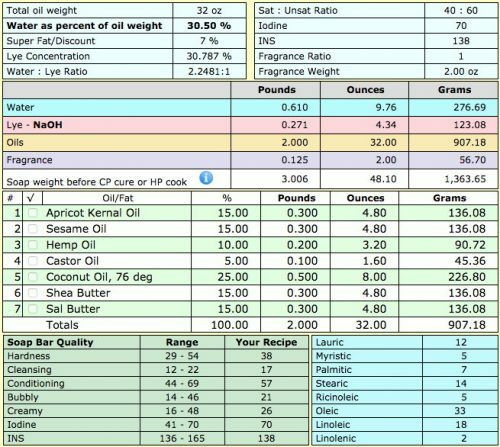 Because my green apple soap recipe is palm free, I did a steeper water discount than normal and included sodium lactate in the soap recipe to get a harder bar. I used two different molds for this recipe – a Crafter’s Choice basic round soap mold and a silicone flower blossom mold. 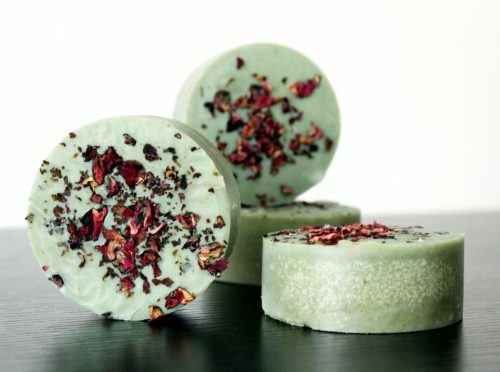 If you use the round soap mold you’ll get about nine 5 oz. soap bars. Alternately my green apple soap recipe will yield around eleven or twelve 4 oz. bars. You should be familiar with making cold process soap before trying my green apple soap recipe. If you’ve never made cold process soap before – or any kind of soap in which you’re working with lye – I strongly recommend you start with a beginner soap recipe so you get a feel for the process and know you can create a successful soap. 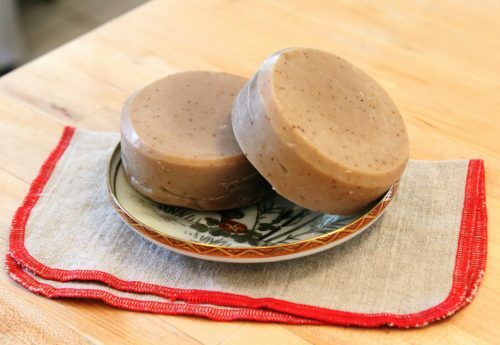 Otherwise, you’ll follow your basic cold process soapmaking instructions to create this soap. You should adhere to all basic safety precautions when working with lye. Next, weigh out the soapmaking fats – these are all of the carrier oils and butters called for in my homemade green apple soap recipe. Heat until melted then set aside. Allow the lye-water and the melted soapmaking oils to cool to around 95°F. Once they’ve reached this temperature, you’re ready to make soap. Weigh out the sodium lactate and stir it into the cooled lye-water. 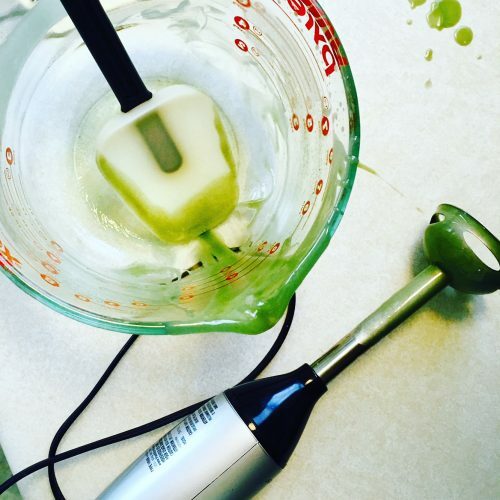 Mix with a stick blender until you reach trace then evenly pour the green apple soap batter into the molds’ cavities. Sprinkle on dried rose petals if desired, then cover with plastic film or parchment paper and set aside in a safe location. 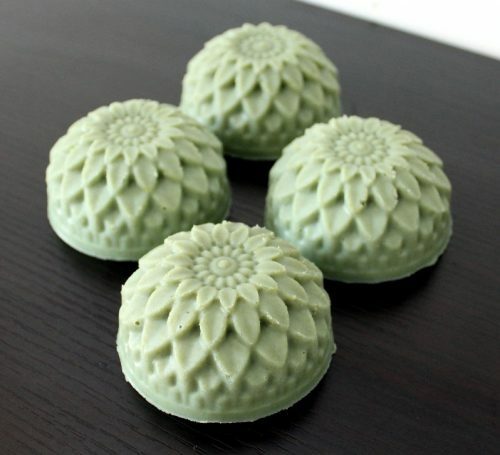 If you green apple soap gels, you should be able to remove the soap from your molds the next day or the day after. If your soap doesn’t gel, or it’s still soft the next day, wait 2-4 days before unmolding. If you’re using the round mold for this soap, it’s a bit trickier getting this soap out of the mold perfectly if it’s softer. So either give this mold more time or pop the mold into the freezer for a half hour or so prior to unmolding the soap. Allow your homemade green apple soap bars to cure 4-6 weeks. Once your soaps have cured, they are ready for use. Simply wrap and label as desired for personal use or gifting. You can also bevel the edges with a potato peeler if desired. 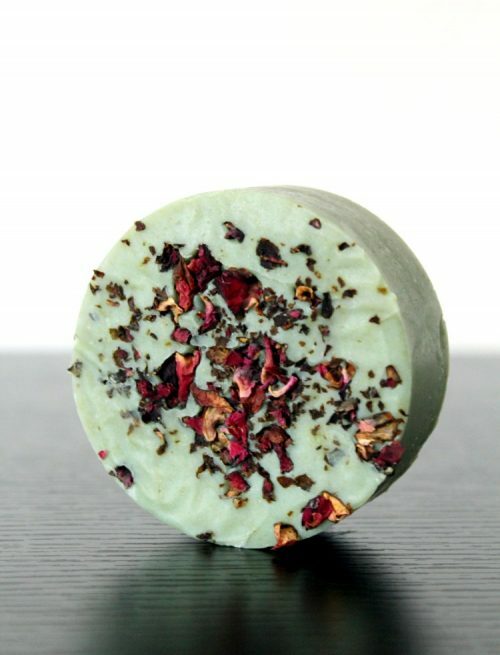 For more ways to create this soap, you can embed soap mustaches into your soap bars for Father’s Day gifts or even soap roses for wedding favors. If you like my homemade green apple soap recipe, then you may also like my chia & charcoal soap recipe made with soothing and hydrating chia seed oil and naturally detoxifying activated charcoal as well as my yogurt & banana soap recipe made with organic flax seed oil and yogurt & banana powders. If you’re planning to sell your green apple soaps, be sure to label them according to FDA guidelines. 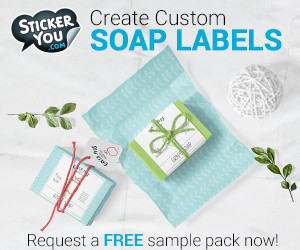 Not sure how to label your creations? I highly recommend the book, Soap and Cosmetic Labeling: How to Follow the Rules and Regs Explained in Plain English, by Marie Gale. 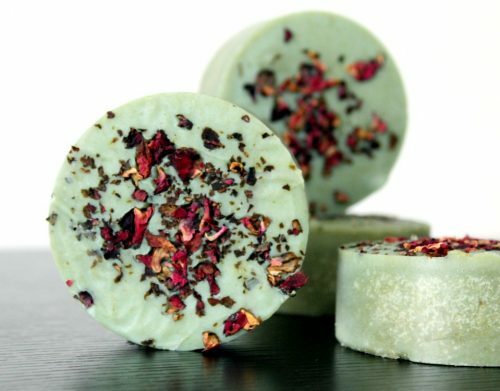 Do you make homemade soaps or bath & body products? Want to see your homemade soaps and bath & body products featured on Soap Deli News blog? Simply add the hashtag #soapdelishowoff to your instagram and twitter posts for a chance to have your handmade products featured on my weekend wrap up posts!